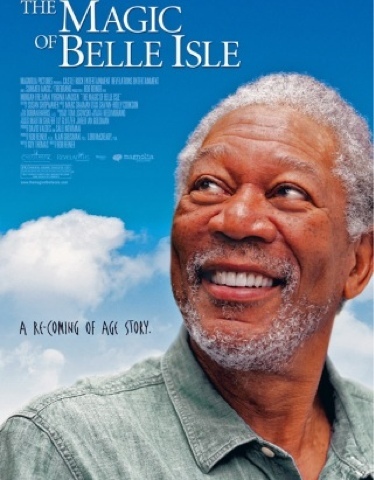 Every now and then comes a movie that makes you cry; feel so warm and smile.. One such movie is the new Morgan Freeman starrer "The Magic of Belle Isle". A movie about a writer who had put his pen away and about a woman with 3girls stuck in a messy divorce in a small obscure town in the middle of nowhere.. When Monty(Morgan freeman) is dropped off at the old rickety house an told this is where he'll be spending his summer in and that he'll have to dog air he is none too happy! Armed with an endless supply of Scotch and sharp tongue he goes about the day.. Things change when his neighbors recognise him, and a little 9yr old comes to him with $34.18cents asking him to teach her to bring out her imagination..
A writer who is inspired by a tiny toy and the mom to write once again, who falls in love with the town, and it's people, even the dog. It's about reinventing oneself.. Rekindling what you once had..
As always, Morgan Freeman blows you away with his acting, especially the scenes where he tries to teach the dog to fetch; shoots his revolver when Twed the clown yells at Carl and his way of tellin Fannigan that if he ever had a little girl, she'd be just like Fannigan..
Do watch or let me know and I shall loan he DVD..